The big one is upon us. Again. Shelves are bare, supplies are thin and by Sunday we'll all be relying on those giant dogs with barrels under their necks for provisions. So before things get ugly, you're going to need to stock up. And let's just say we found a meal that should sustain you until you finally tunnel out. Introducing the glorious haute monstrosity that is the Pit Burger at Kitchen 2404 in Glover Park, a massive monument to meat that will provide you with breakfast, lunch and dinner all at once as you ride out the storm. Like a Steven Seagal-Chuck Norris fight scene, think of this as a controlled collision between two great American institutions: the cheeseburger and the pulled-pork sandwich. Like with most great achievements, Chef Alex McCoy begins with a half-pound of Angus beef, blended with herbs and brown sugar and brushed with butter before hitting the grill. 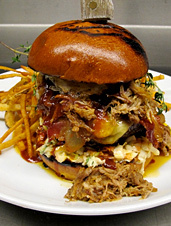 Once that's on your plate, he adds a mound of pulled-pork BBQ (slow roasted for six hours and doused with his proprietary sauce), bacon, Gouda, caramelized onions, coleslaw—and a fried egg. 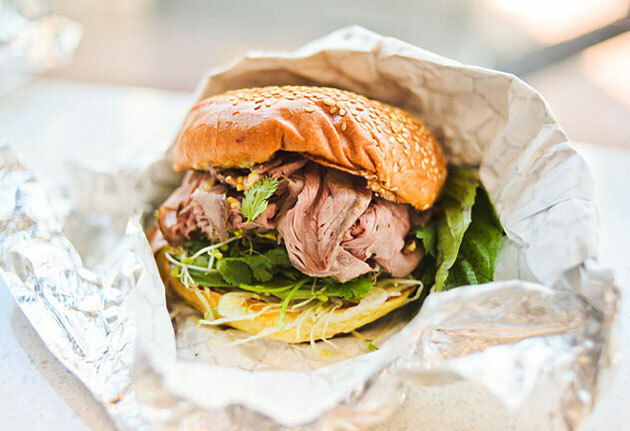 The result is an amalgam of vinegar, smoke, onion and salt that can't be contained by a simple bun—the bread acting as little more than a familiar landmark to remind you that this graceful little meal in front of you is technically a sandwich.